We’re pleased to welcome a new chef to Mrs. G’s Community Kitchen. 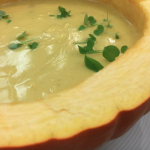 John Eccleston is an internationally lauded chef and culinary consultant who at one point in his storied career served as Director of Food, Innovation and Development with Starbuck’s. Among his many travels, he often comes to the Princeton area to visit family and friends, some of whom happen to be good friends and industry partners of Mrs. G! Long story short – Chef John will now be baking twice a month on weekends at Mrs. G and we couldn’t be more excited! 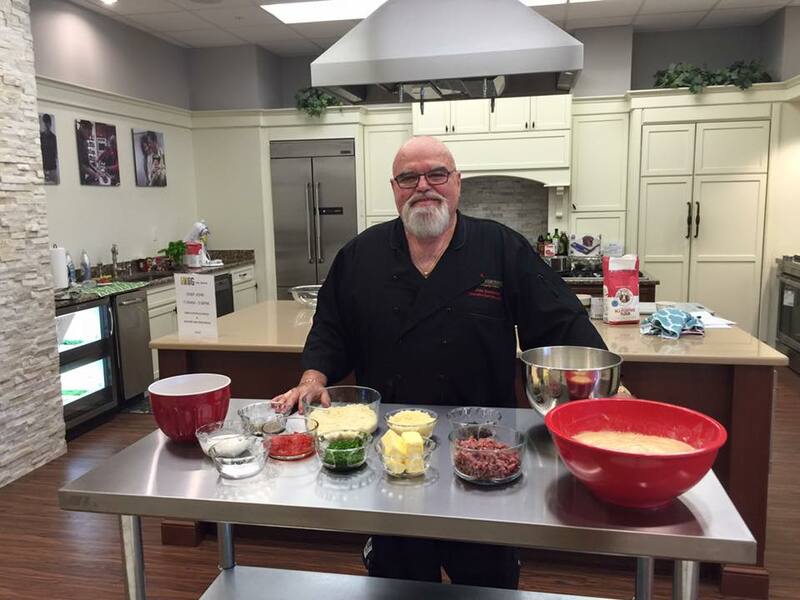 For his first demo in our Jenn-Air Community Kitchen, John prepared 3 breads in the 24-in steam and convection oven: herb casatiello, sausage and herb, and a spinach, cheese and herb. All 3 filled our showroom with the most mouth-watering aroma you would want in an appliance showroom. 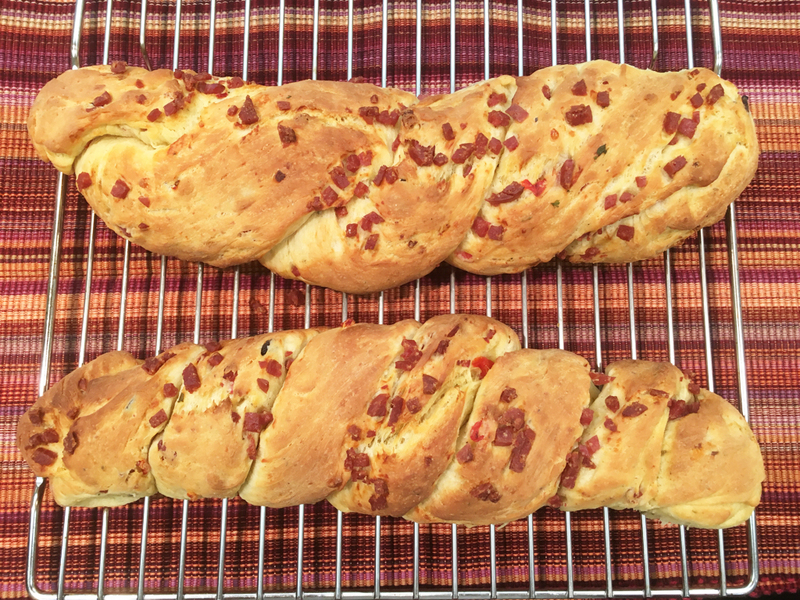 The herb casatiello bread is a rich Italian elaboration of brioche, loaded with flavor bursts of olives, sage, parsley and Italian salami that is sweetened by the roasted red peppers and finished with the rich flavor of aged parmesan cheese. 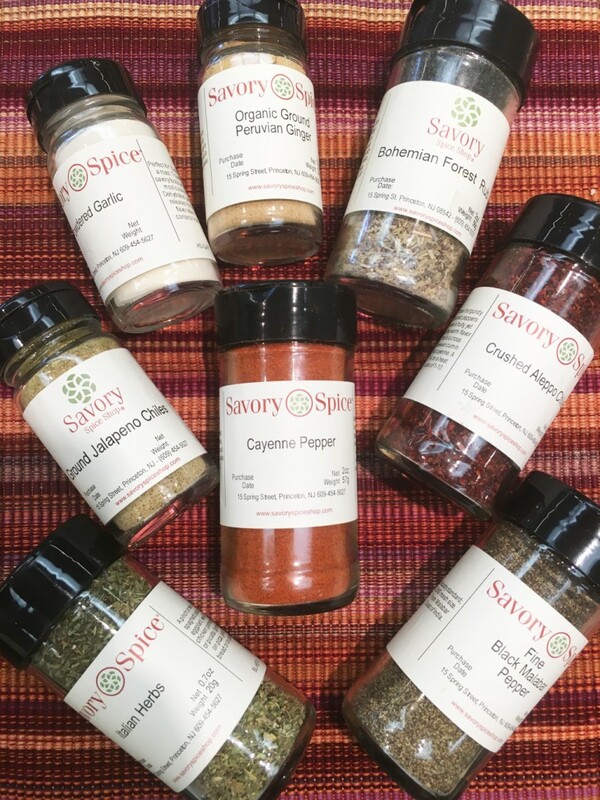 All of the dry spices we used were purchased locally at Savory Spice Shop in Princeton. The bread is traditionally baked in paper bags or panettone molds, but can also be baked in molds or loaf pans. A good way to think of this bread is as a savory version of Panettone or a poor man’s Brioche. 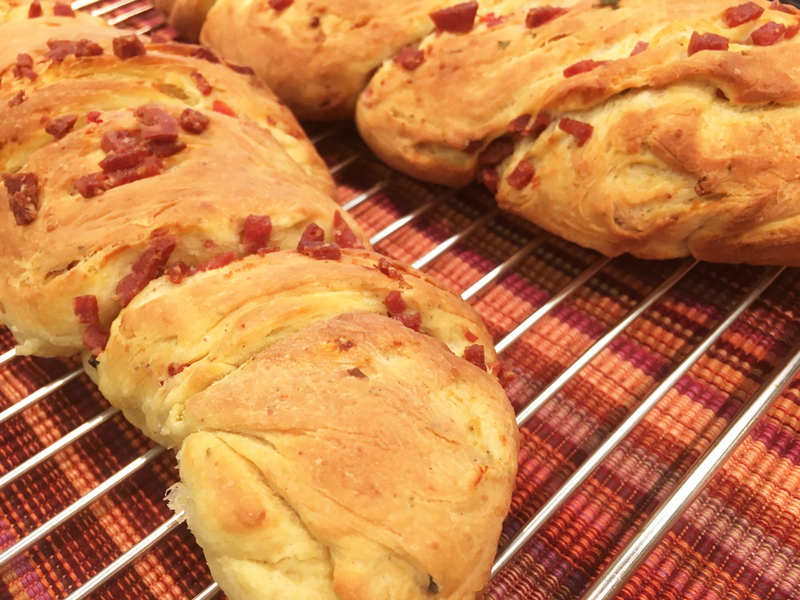 The profile of this bread is rich, standard dough, indirect method and uses dry yeast. 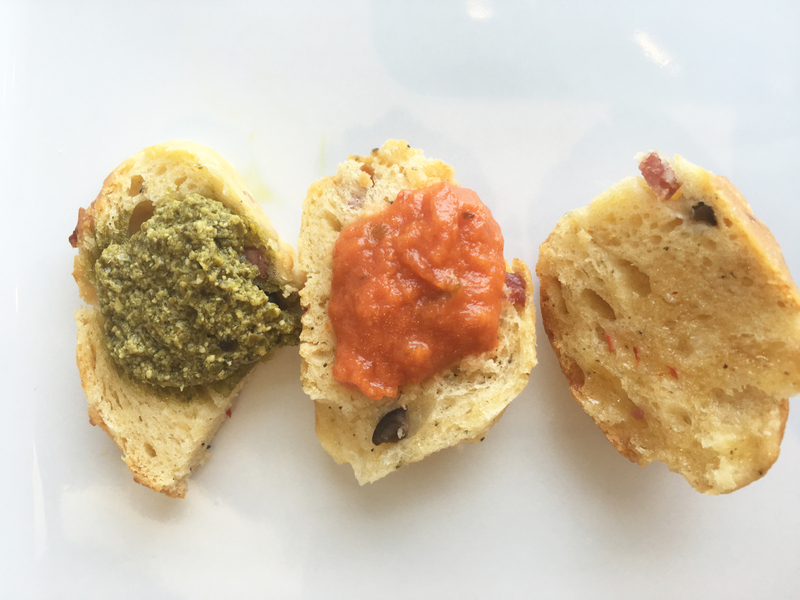 While the bread should really be enjoyed on its own, Chef John prepared 3 dips for sampling: a vodka sauce, pesto, and honey with cayenne pepper. While the vodka sauce is something you would expect for an Italian bread, the pesto and honey were the winners among the staff. The honey in particular offers a sweet compliment to the savory flavors of the bread. 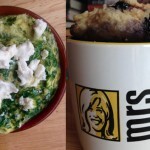 Before you begin: You will notice a change to the ingredient measurements. Measuring in grams is the most accurate way to bake. All you need is a food scale, which can be purchased anywhere that kitchen gadgets are sold. We purchased an OXO scale at Kitchen Kapers in Princeton. 2. Make sure that the water is between 90 – 100 F. in order to activate the yeast. 3. Prepare the egg yolks by placing into a small bowl and whisking them until they are completely mixed into a continuous mixture. 4. Mix all ingredients together in a large mixing bowl until the flour is completely hydrated. 5. Let stand and ferment at room temperature for about 3 hours. 6. If desired, in order to increase the flavor and the texture of the bread, after the 3 hours place into the refrigerator overnight (12 to 24 hours). 7. 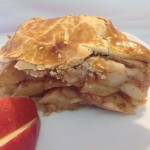 Note: The dough can also be made a day ahead, and then shaped and baked the following day. But like brioche you must chill it as soon as it comes off the mixer to avoid over fermenting. 5. Place the egg mixture, buttermilk mixture, sugar and salt together in a large mixing bowl. with a paddle attachment. Mix until all ingredients are evenly incorporated into the solution. 6. Add the sponge and continue to mix until blended. 7. Add the flour and mix until you get a shaggy mass. 8. Add the butter and continue beating until a rough dough is formed. 9. Next mix into the flour the roasted red peppers and the black olives. 10. 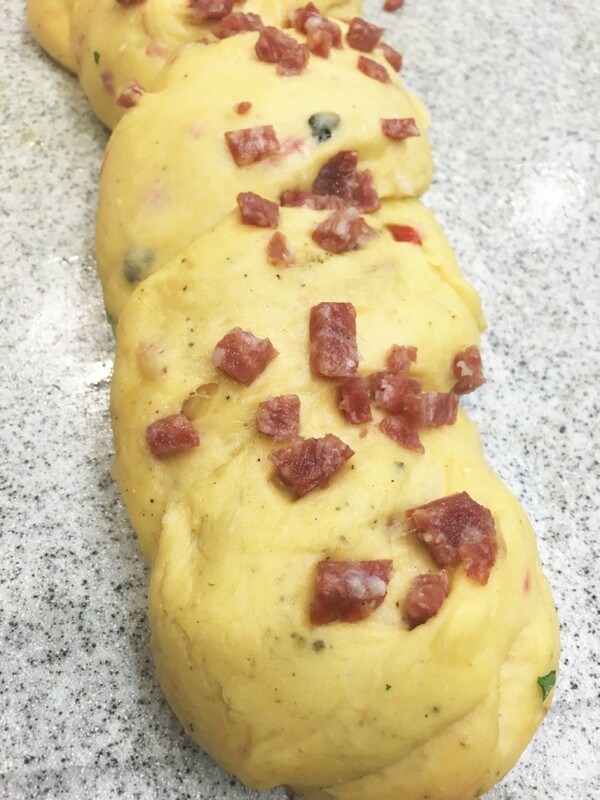 Sprinkle the Sage, Black Pepper, Two Cheese Mix and Salami over the dough (a little at a time) and mix until it is roughly blended. 11. Change to a dough hook and knead at medium speed until elastic, supple and fairly smooth. This should take 3 to 4 minutes. 1. Place the dough in a lightly oiled bowl, cover with plastic wrap and let rise until almost tripled, about 1 and ½ to 2 hours. 1. Push down the dough and let it continue to rise for about 1 more hour. 1. Place the dough onto a large cutting board. 2. Cut the dough into equal pieces. 3. Roll up each piece into a cylinder. 4. Leaving about ½ inch not cut; cut the cylinder down the middle so that the dough has two equal strands. 5. Take the two strands, one in each hand, twist them around each other. 6. Generously flour 4 pieces of parchment paper on peels or baking sheets. 7. Place each loaf on the paper or the baking sheet. 8. Cover loosely with dampened towels and let rise for 1 hour. 1. Preheat the oven to 375 degrees F.
2. It is optimal if the oven contains baking stones. 4. Just before baking, sprinkle the stones with cornmeal. 5. Carefully place each loaf onto the stones. 6. Bake until golden brown.